Do you want to optimise your BULATS® score? This complete up-to-date guide will help you prepare the test so that you are in top condition to show off your business English skills. 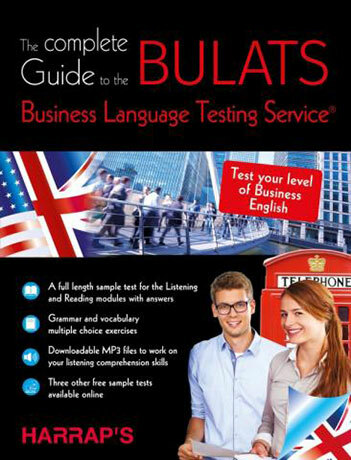 To make sure you get a good score - This guide is organised in two sections that cover the Listening and Reading skills tested on the BULATS®. Practice tests with explanatory answers on every type of question so that you can avoid common mistakes. A full length test to help you prepare the Listening and Reading questions. Three other free sample tests online which offer an authentic training for the real BULATS® test. More than 1,000 multiple choice grammar and vocabulary exercises to help you get the best possible score. Tips and strategies for every type of question in the Listening and Reading sections. Listening and Reading training materials suitable for all levels, from beginner to advanced. Tips to help you find the answers quickly and manage your time. All the audio files downloadable as MP3s to improve your Listening score. Answers to all the questions at the back of the book.